When I saw a man handing out food on Nassau St. next to Nicky’s Vietnamese Sandwiches, I thought I was going to get a little free banh mi action. Instead, I discovered that a place called Pisillo Italian Panini had opened next door with a super-focused menu of only sandwiches. There are 25 varieties with fillings such as prosciutto, salami, tuna, sopressata, fresh or smoked mozzarella and various spreads and toppings it’s a bit like Alidoro in that there aren’t any parm sandwiches or other Italian-American concessions made. Prices range between $8.50 to $11.90 and note that it’s cash only. As always, if you eat there, let us know how the food was in the comments! 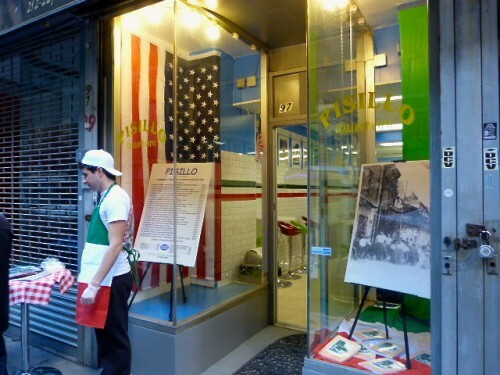 Posted by Andrea H at 9:30 am, November 19th, 2013 under Financial District, Italian, Openings, Pisillo Italian Panini, Sandwiches. I might give it a shot tonight. Will post back impressions. This place was good. I took a couple of photos. The paninis are huge and they use good fresh ingredients. The mozzarella was especially good. I think the paninis would be very tasty pressed hot, too. Not sure if they do that.